The control software consists of multiple PHP scripts. Basically they put a HTTP-request via Dyn-DNS to the IPM and the IPM returns a HTTP "page" that contains the answer. The IPM is (due tue limited memory capacity) only able to store three messages in the internal queue. Therefore I implemented an additional online queue that stores the "overflow-messages" and the IPM will download them as soon as the internal message-queue has free storage capacity. The IPM-script files consists of about 1000 lines of code (PHP and HTML). After checking the availability of the connection, either the online menu with the full function set, or the offline menu with a reduced funtion set will be displayed. This is the message dialog. where you can create a messsage and send it directly to the IPM or put it in the online queue, if the IPM's internal queue is full. You can also select some predefined messages as well as options for the message - if it should overwrite existing messages and the sound to be played. In addition, you can display the IPM's internal message-queue and remove messages from it. This is one of the setting menus. All settings will be set by this function as the IPM itself does not provide an adequate way to do so. The settings include the structure and commands for the IPM's user menu. Due to the limited memory capacity of the IPM, parameters have to be send one at a time - so every single setting has to be read and written seperately in stead of writing the whole set at once. The offline-menu is also accessible, if the IPM is not on or not connected. 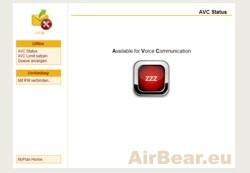 The AVC-status (Available for Voice Communication) can be set by executing the respective menu entry from the IPM. 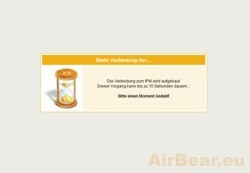 The status is saved online, so everyone has access to this status information. The IPM can set the status to "yes" or "no", while the online-script allows you to set the status to a time-limited "yes". This is the management of the online queue. If the IPM is not online for any reason, messages (and commands) are stored in this online queue. This also happens when trying to send a message to the IPM with already three messages in the internal memory (memory full). The IPM will poll this online queue regularly (interval set via settings) and thus display these messages when online and/or memory available again.